So, I've made a third item for The Refashioners 2016, yep, you knew I would. 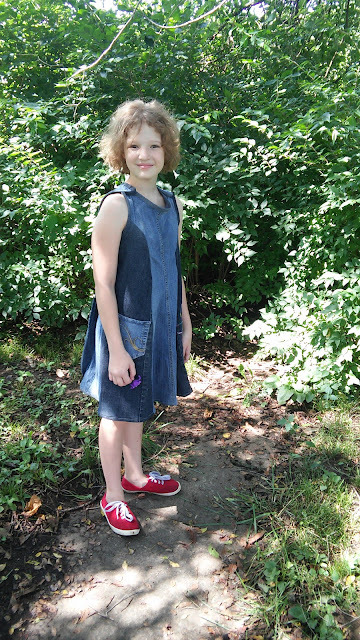 My record shows that when I get into sewing for a theme, refashioned shirts, shorts, even historical dresses, I can't stop at just one or two. Also, I have a heck of a lot of old jeans to do something with. Thus, I definitely had to make my sister something. 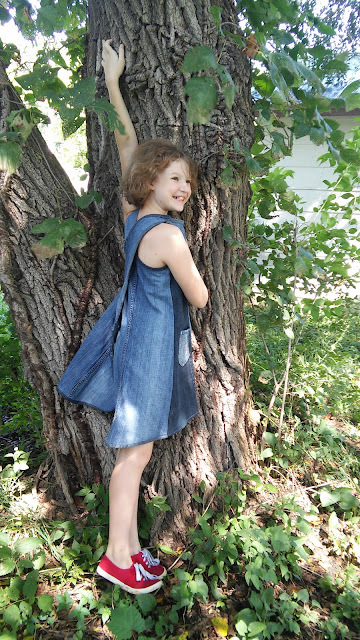 Three pair of jeans makes one fun swingy wrap dress. 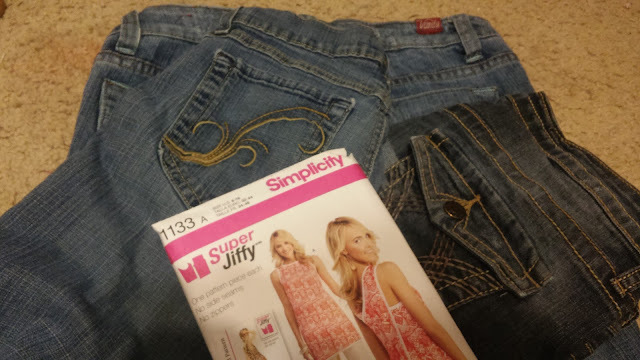 I started with Simplicity 1133, two medium colored pairs of jeans, and one darker pair. All were about the same weight of denim. Now, Simplicity 1133 is a reprint of a 70's (I think) pattern. It's rather straight, not swingy at all. Also, it's a miss sized pattern, not a girl sized pattern. 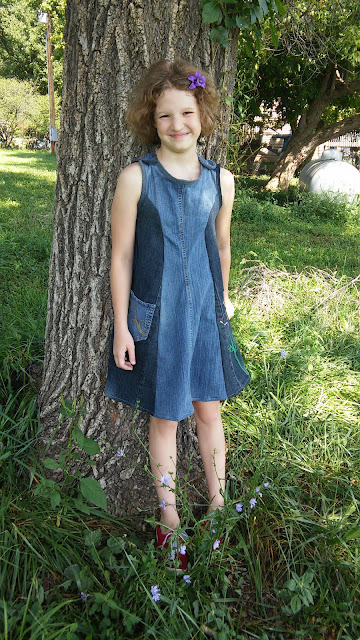 However it's a wrap dress that buttons at the shoulders and that's exactly what I wanted for this project, it just required some adjustments for my girl's size 12 sister. 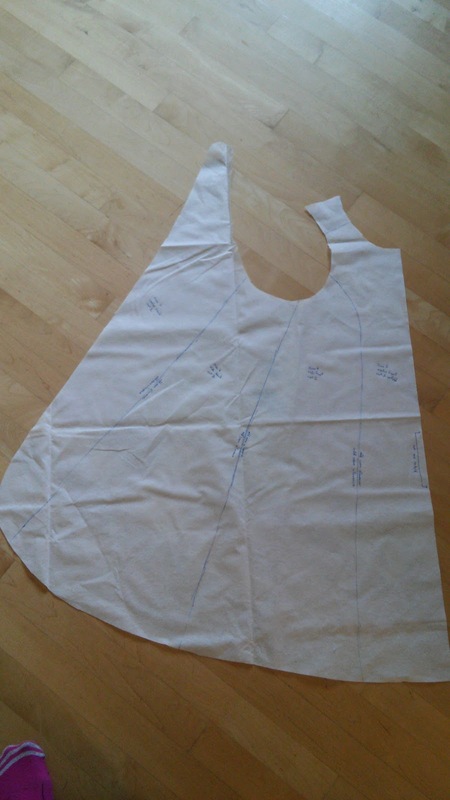 First, I traced off the pattern in the smallest size, a 6. Next, I cut the traced pattern up from the bottom to the tip of each of the two darts. I folded over the darts the way they were supposed to be sewn, and then spread my slashes until the paper pattern lay flat. 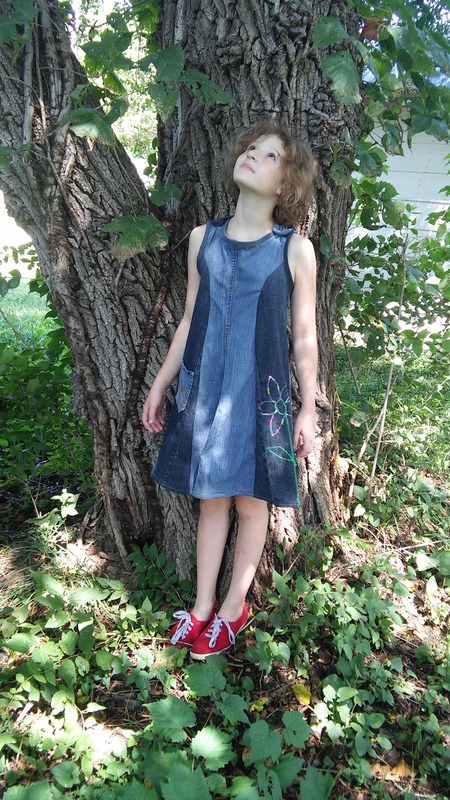 This eliminated the need for darts and added some swing to the hem. 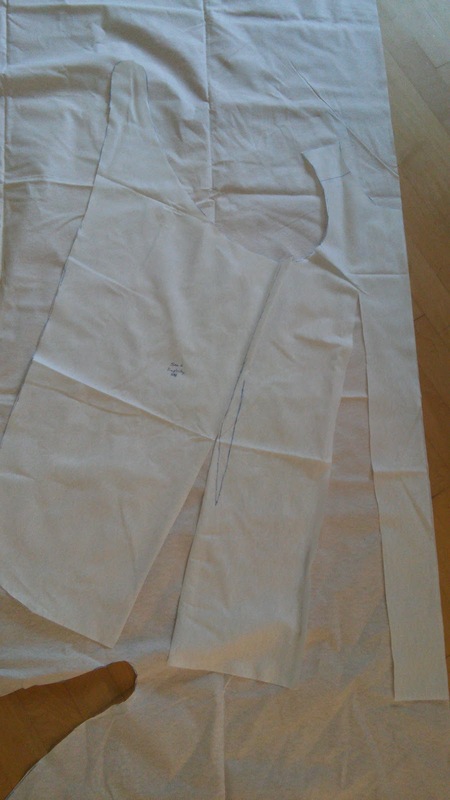 I traced around the cut and folded pattern. 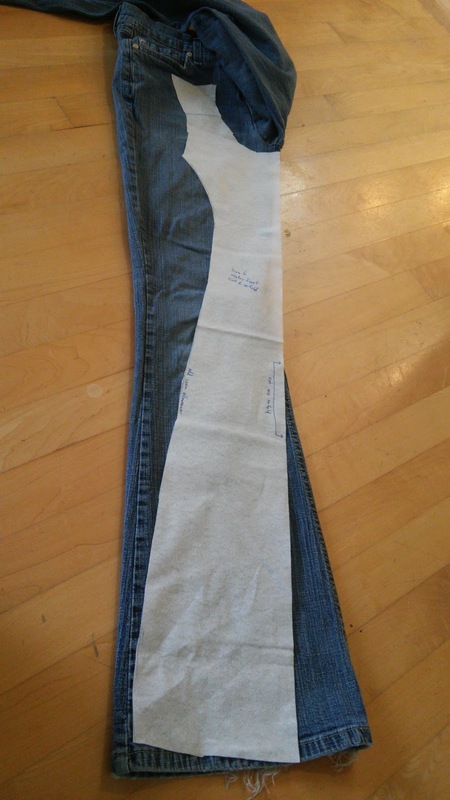 I drew lines on my new pattern to make panels that would fit on jean legs, then cut my pattern apart. 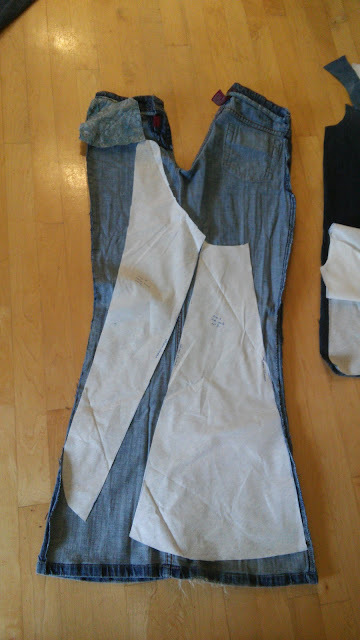 This way I was able to reduce the width of a couple of the panels in order to down size the pattern so that it would fit my sister. 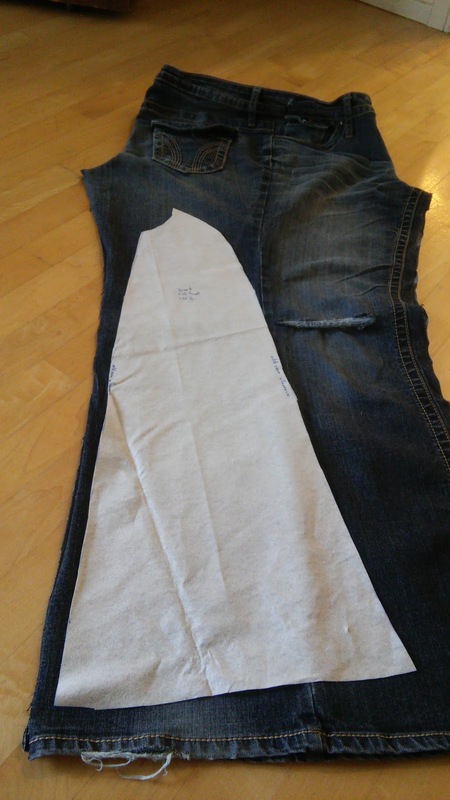 The center front panel I cut out of one of the lighter pairs of jeans, using the inner leg seam as my fold to include a fun jean detail. I added a little extra width here at the hem for some extra swingy-ness in the finished product. 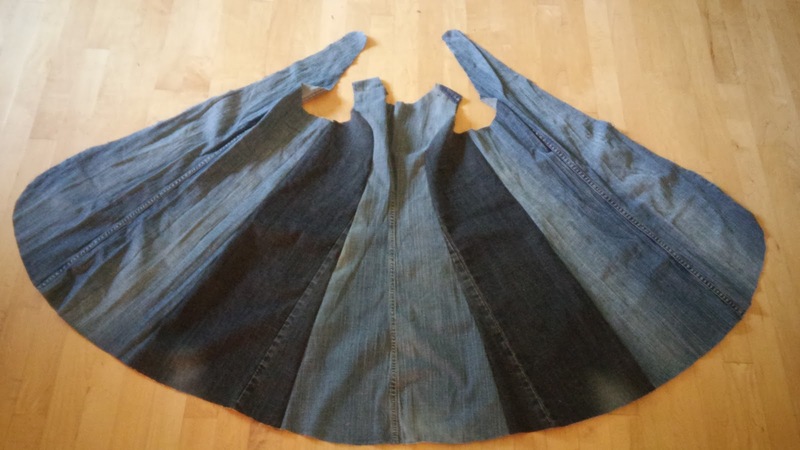 Working hard to avoid the ripped knee, I cut the side panels from the darkest pair of jeans. 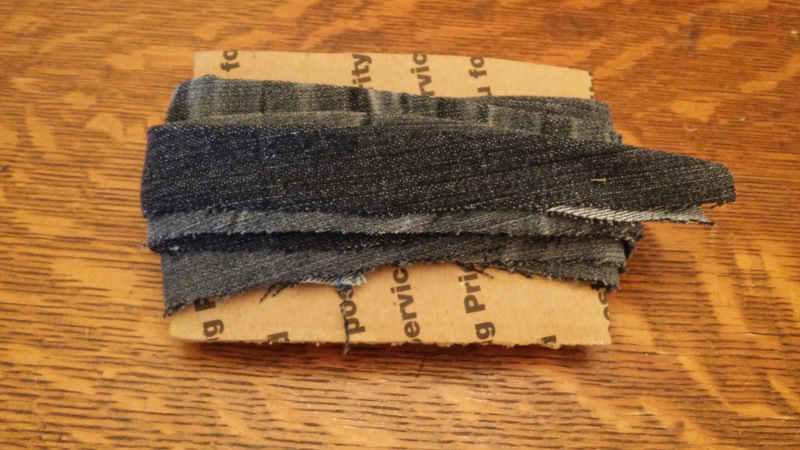 I cut what was left of the dark jeans into strips to make binding for the dress. I sewed it all together and got this. Next came the binding and the buttons, then the finishing details. A flower I embroidered using the satin stitch on my sewing machine. I think this is my sister's favorite part of the dress. On the opposite side panel I attached one of the back pockets from the pair of jeans I used for the front panel. Now about that front panel. I forgot to grade the neckline smaller when I made the pattern, thus it doesn't lay flat. I'm not happy about this, but I didn't know the neckline was an issue until I gave the dress to my sister and she tried it on. She loves it! And now I can't get it back from her to fix the neckline. Believe me, I've tried, and she's not having it! She's worn this dress 3 times since I finished earlier this week. Every time I've turned around she's wearing it again! I've more or less resigned myself to the fact that I'm not going to get to fix that neckline. However my sister has already requested a second dress just like this one, and on that one I'm gonna get that neckline perfect! What a great dress for your little sister. 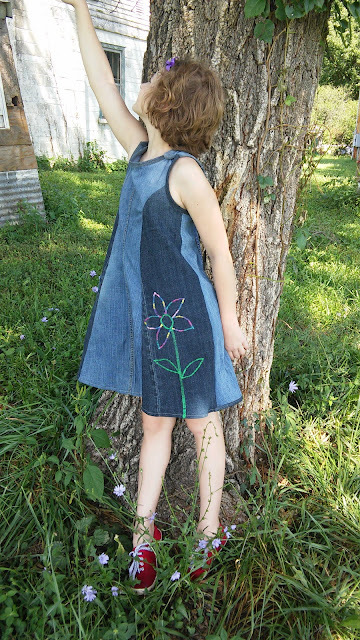 The embroidered flower looks very nice. 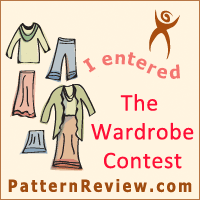 A well done refashion. Thanks! I'm glad I'm not the only one who finds sewing certain things addictive. This challenge has been great for really stretching my creativity! Oh gosh, I think I'd enjoy wearing this jean dress too! Love it! How did you embroider the flower? Did you draw it first? It is a lovely detail. Thanks! 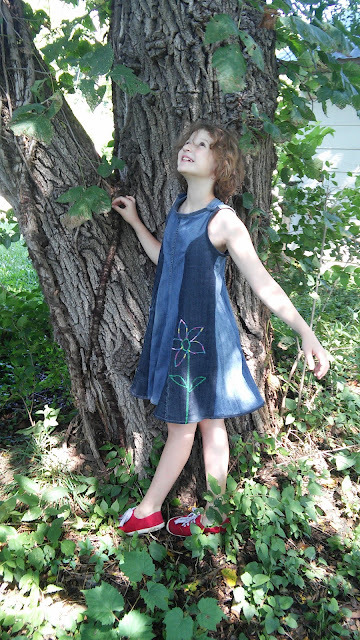 I drew the flower with tailor's chalk then sewed along the drawing with my regular sewing machine set to a very tight zig-zag. I'm a young woman trying to figure out God's plan for my life while keeping myself busy sewing and raising Alpine Dairy Goats. 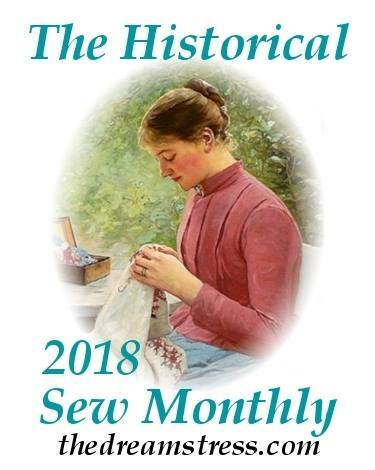 I've been sewing since I was 6 and have ventured into historical costuming. I enjoy making modern clothing and all types of costumes for myself, friends, and family. I've had dairy goats since I was 12, and I enjoy them immensely! 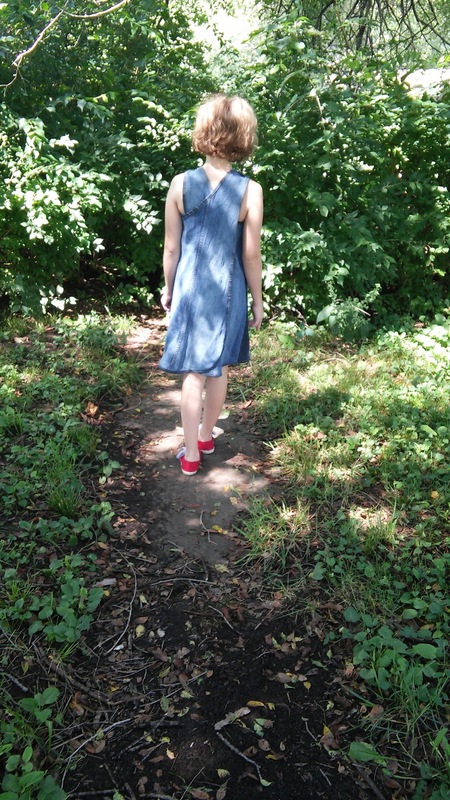 On this blog you will find what my current sewing projects are, what my past projects have been, what's going on with the goats, and occasionally my thoughts on what I think God is calling me to do with my life. Enjoy! The 1895 Minerva McGonagall Tea Gown - Finished!